Powerful former PNU Activist and now Othaya MP Mary Wambui (TNA) is said to be the current tenant of the worst financial rip-off and excess of the Kibaki government that only Mt. Kenya Mafia could imagine – the sh. 500 million Kibaki farewell villa. The palatial home, build at a time the country was experiencing the worst recession when both health workers and university lecturers were on strike, with college students spending months without HELB loan and free primary education funds dwindling, has never been used by the expected owner, wealthy former retired president Mwai Kibaki. 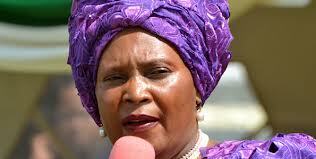 Set on lush canopied Mweiga farm overlooking Nyeri-Nyahururu highway, the palace is currently being allegedly used by Mary Wambui as a weekend leisure gateway away from Othaya residents and her other public worries, including colluding with Jubilee government dark forces to derail President Uhuru Kenyatta’s ‘jubilee agenda’. Kibaki has remained holed up in his Muthaiga home on Chui Road, where it is alleged he has twice declined to vacate and move to his retirement palace. A lobby is said to be planning moving to the court to convert the home to a national high school.